Details have emerged of a sweet surprise Olympic diver Tom Daley cooked up for his groom Dustin Lance Black at their wedding in Devon earlier this month. The pair tied the knot at Bovey Castle on Dartmoor in front of 120 guests - and Tom had a surprise in store for his new husband. He'd originally planned to make the wedding cake himself, but enlisted the help of baker and Youtuber Cupcake Jemma to put together something "amazing". Details of the cake were kept secret from Dustin - but the couple's British and American homes were honoured in the design, which was in the colours of the Union Jack and the US flag. I'm not sure if I'm getting married or if it's 4th of July! 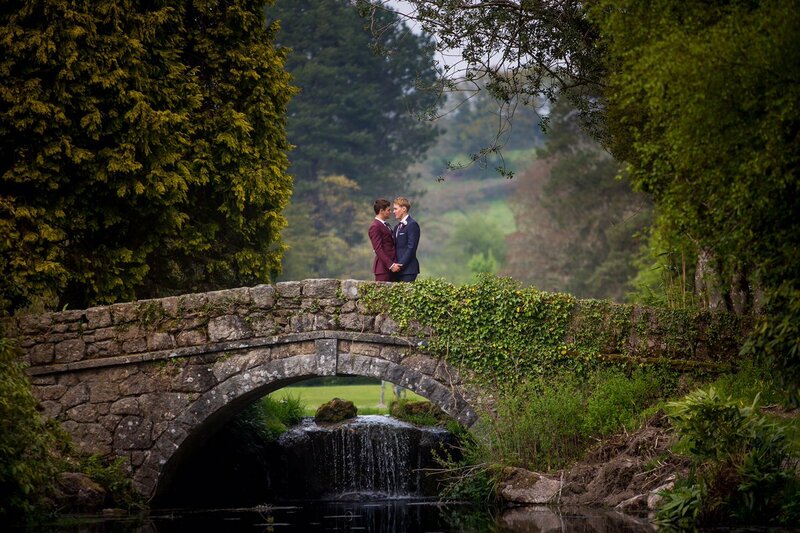 Read more: "The day I married the love of my life"
It was the icing on the cake for an idyllic West Country wedding - Tom and Lance made their entrances accompanied by a string quartet. After exchanging their vows, members of the London Gay Men's Choir sang the Bruno Mars song Marry Me.